Peru is a multicultural country and thus has many festivals that occur throughout the country totally different from each other. The festivals of Peru show the fervor of its people and are often linked to religious origins. At certain times of year, Peru seems to be a country of endless festivals, parades and parties. The rocket blasts break the calm almost every day, small groups of people through the city and on great occasions the streets are crowded with people celebrating all night. Description: There are various civic and cultural activities by the Spanish foundation of Lima. Description: The Libertad Club, one of the most prestigious institutions in the city of Trujillo, is responsible for organizing the National Contest of Marinera. Trujillo is the site of the National Contest of Marinera, one of the most elegant couples dance in Peru. Description: For 18 days, people worship the Virgen de la Candelaria in the church of San Juan. The cult is possibly associated with pre-Hispanic ritual to Pacha Mama, or Mother Earth. Description: The Carnival of Cajamarca is perhaps the most representative of the country for purchasing their own characteristics and a specific organization. It is done with very typical expressions and with the participation of institutions, neighborhoods, etc.. The celebration lasts about a month, but the main days are reduced to 8. In cities like Huanuco, Ayacucho, Abancay, carnivals are also very colorful, with dances. Description: This festival created as a result of the ethnic essence that still exists in this area. At the Carmen arrived slaves from Africa, who retained their own customs, which were melted and led the Afro-Peruvian dance. Description: The first Saturday of February is celebrated all over the country's national day of pisco sour, Peru's national drink. Description: It is a celebration that is done by harvesting grapes. During the festival contests wine and pisco organized, cockfights and paso horse are presented. Description: The celebration of Easter greater fervor in the country takes place in Ayacucho. Description: Usually the feast of Peruvian Paso horse lasts a week. The final of the contest ends with a display of favorite horses, prizes and demonstrations of the skills of horses, one of them is that the horsemen paraded their horses with Peruvian coastal dances, particularly the Marinera. Description: Popular verbenas, fireworks, sporting events, etc. Description: Religious processions in liturgical actions, where they dance the "chonguinada" with bands of pilgrims. Is consumed typical dishes such as pachamanca. Description: Traditional pilgrimage to the Shrine of Chapi about 76 km from Arequipa. Many devotees come on foot. It is customary to promise to get 3 consecutive years at the sanctuary. Description: The most colorful celebration takes place in the community of San Juan (Iquitos, Loreto). Description: The main event of the celebrations for the month of Cusco. It evokes the splendor of the Inca religious ceremonies. 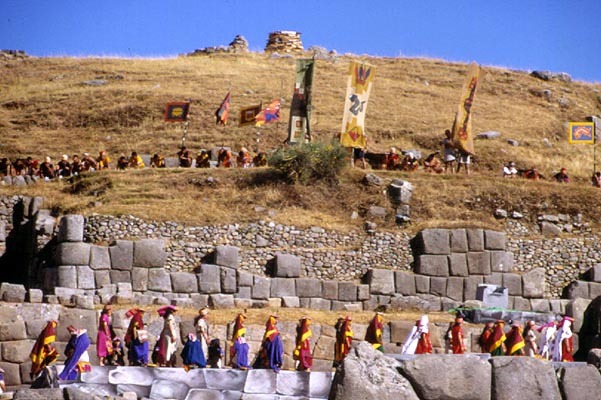 The staging begins in the Qoricancha, continuing in the main square of the city and ending on the esplanade of Sacsayhuaman. The central role is performed by the Inca. Description: The celebration begins with novenaries, holiday, parade, variety of dances with colorful costumes in their dances. For Paucartambo is time to visit Tres Cruces and spectate sunrise. Description: Commemoration of the Independence of Peru. There are parades and civic ceremonies. Description: Celebrated with serenades, the parade of friendship and fairs, etc. Description: The ancient rite in the Andean worldview, Mother Earth has an important place. The ceremony begins the evening of August 1 with the preparation and burning of offerings. Description: On this date it is customary to visit the chapel built by her, and throw letters with requests to the well where the saint threw the key of her cilice. Description: The streets and houses of the colonial city of Trujillo are decorated for the parade of allegorical cars, which is headed by the Queen of Spring. Description: a procession through the main streets of the city, from evening until the next day. Description: A celebration that seeks to encourage national and cultural identity, with special emphasis on the city of Lima, as the center of origin of Creole music. Description: Despite being held across the country, the festivities stand out in the departments of Cajamarca and Piura. Description: (Specially in Cusco). It is a religious festival that has enough roots in the population of the Andean department. There are masses, performances of native dances.